Mighty Diamonds are a Jamaican harmony trio, recording roots reggae with a strong Rastafarian influence. The group, which comprises Donald "Tabby" Shaw, Fitzroy "Bunny" Simpson, and Lloyd "Judge" Ferguson, was formed in 1969 and remains together as of 2010. They are best-known for their 1976 debut album Right Time produced by Joseph Hoo Kim and the 1979 release Deeper Roots. Their first hit singles "Country Living" and "Hey Girl" were recorded and released by the Channel One label. Two of their greatest songs are "Go Seek Your Rights" and "I Need A Roof" both from the mid 1970s. The latter was remixed in a techno style in the mid 1990s. 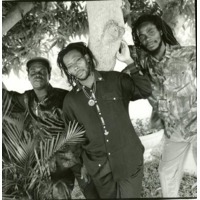 The classic Mighty Diamonds style is 'roots reggae', in their case characterised by close harmony lyrics, Tabby's relatively high-pitched lead vocals, and earnest, 'conscious' lyrical content. Instrumentation was not as bass-heavy as some of their contemporaries in the 70's. "Pass the Koutchie", written by Leroy Sibbles and Jackie Mittoo, became an international hit twice, when first released (on their 1982 album Changes) and again when it was covered by Musical Youth and released as "Pass the Dutchie". Tabby, Bunny and Judge have produced over 40 albums in their long career.